Unfortunately I was at the wrong end of a bad football tackle several weeks ago. 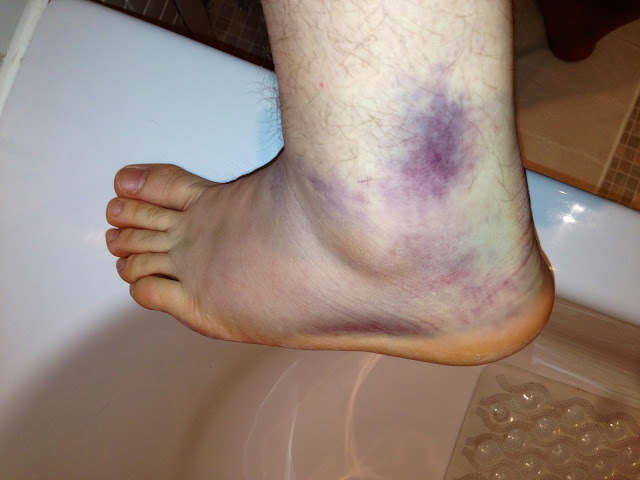 I stretched to reach a ball and at the same time another players foot came over the top of the ball and all his weight went down on the side of my ankle. Onlookers told me my ankle was for a moment at almost a ninety degree angle to my leg. I went to hospital to have it checked out where an X-ray confirmed it wasn't broken. It was however severely sprained, badly swelling and extremely painful. The only exercise I have managed to do in the last several weeks has been walking the mile to work and back which hasn't given me too much trouble. Strangely though I have found that despite the fact I can walk miles on flat easy going ground, as soon as I run on it even just crossing a road in front of traffic my ankle hurts for hours afterwards. My brother in law Tim, who is trying to get mountain days in before his three peaks challenge, wanted me to take him up Scafell Pike. As it had been several weeks now and I felt I was recovering fairly well I told him I could do Scafell Pike this weekend. To say I have missed mountain days would be a major under statement. I go a bit mad when I am injured and unable to play football or walk up hills. Weather wasn't looking too good for the weekend. Friday night's forecast showed wind and rain for most of the Lake District. I packed three season gear due to the forecast and picked up Tim from Altrincham en route. This was to be the first trip to the Lake District in my new fuel efficient car. 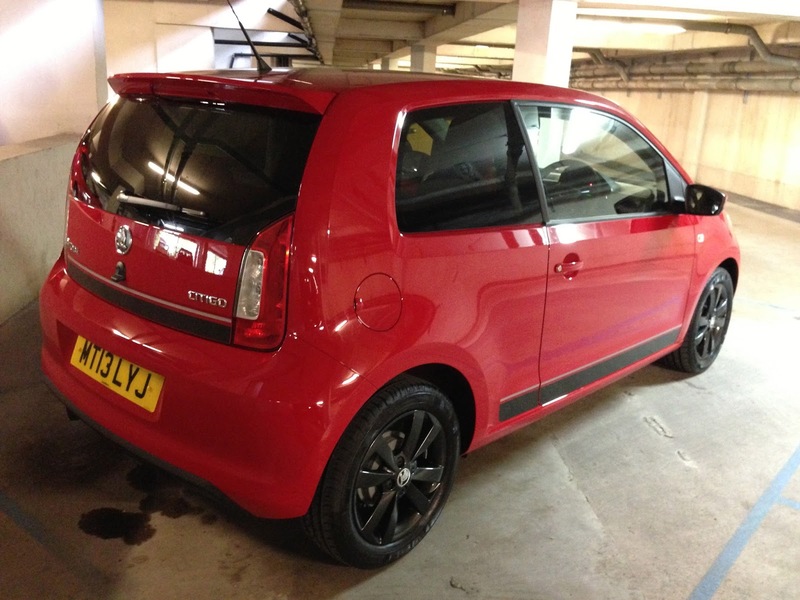 I have purchased a new Skoda Citigo Sport which looks sporty but is actually a sheep in wolf's clothing. It has a sports trim including lowered sports suspension on the outside but hides a gentle fuel efficient one litre engine on the inside which costs only twenty pounds a year to tax due to its green credentials. It is a brilliant city car which feels like a much larger car when out on open roads and motorways. Despite being only a one litre engine it happily keeps up with the rest on the motorway and is great fun when being thrown around corners, like those on the road through Borrowdale. I'm delighted to say the fuel efficiency is as good as advertised and I got an average of 63.8 mpg from the car which meant that I managed to get to Keswick on just £12 of petrol. In my old car it would have cost me twice as much! The journey up was easy enough with no major traffic problems. On several occasions the heavens opened and we both looked at each other and laughed at the idea of walking in torrential rain. We arrived at Seathwaite and managed to find a parking space not too far from the farm. The weather meant that the usual crowds had stayed away this weekend. Last time I was in Seathwaite I was half asleep in a minibus half way through the Six Peaks Challenge for Water Aid, weather was pretty pish that day too, and several people pulled out of the event. Blisters and a slippery boulder field on Broad Crag claimed a few victims. It was raining when we arrived so we put our waterproofs on and set off through the farm yard and on to the track towards Stockley Bridge. We helped out a bunch of lads at the farm who had no map and wanted to know in which direction they needed to go so we pointed them in the same direction we were, heading along the track to Stockley Bridge. The streams that cross the track to Stockley Bridge are usually just a trickle or completely none existent but today they were flooded and quite tricky to cross. When we reached the bridge we made a final decision on our route and chose to head west up Greenhow Knott towards the Corridor Route which neither of us had done before. We looked back at the lads we left earlier and noted that their pace was extremely slow and they hadn't made it even half way to Stockley Bridge from Seathwaite yet. Unfortunately I have developed high blood pressure recently and I am taking Propanolol beater blocker tablets which have a detrimental effect on my energy levels when exercising as they block adrenaline to my heart. This was the first ascent I had done since I started taking the tablets and I was really starting to feel it. By the time we reached the top of Greenhow Knott I had a stitch, my chest was pounding and my legs felt like jelly. I was seriously unfit right now. Topping out on Greenhow Knott meant we were no longer sheltered from the strong south westerly winds heading through the Styhead Pass, which were now smacking driving rain into our faces. Days like this remind you why you spent almost three hundred quid on a top waterproof jacket. The paths alongside the Styhead Gill, which can be rocky at the best of times were also flooded with water from the gill which was in spate. When we reached Styhead Tarn I took the map out to see where the Corridor Route path turns left off the path. I soon realised we had passed it slightly so headed over ground in its general direction and eventually picked up the correct path. 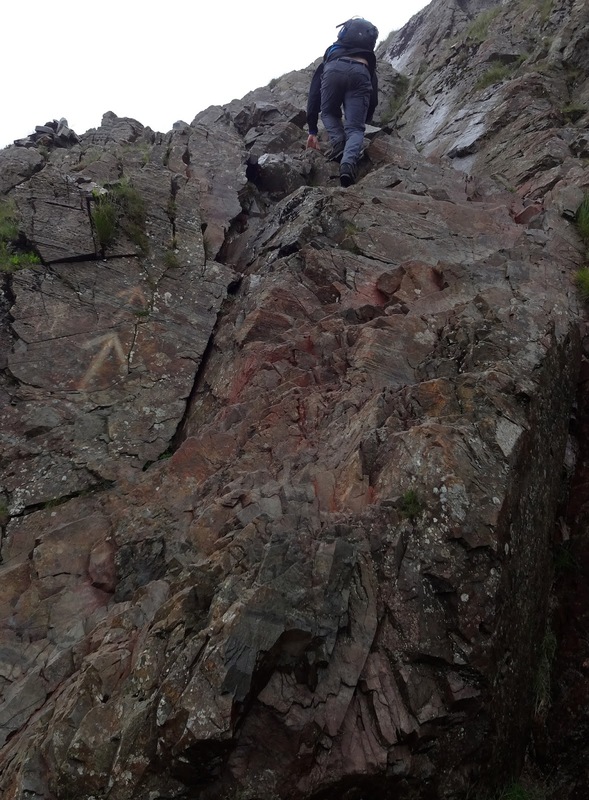 We followed it down hill at first to Spout Head under the steep crags of Great End. The path then started a surprisingly rough ascent clinging to the mountainside and crossing several small and a few larger and impressive gullies. The first gully Skew Gill was really impressive and seemed to just dwarf us with its massive chasm. I was pleasantly surprised by how rough the Corridor Route was as I always considered it to be the tourist route up Scafell Pike. I came across some beautiful looking Parsley Ferns that were just calling out for a photo. It was fairly sheltered on this the north eastern side of Scafell Pike so we stopped for a few sarnies whilst looking out over the Styhead Pass towards the slopes of Great Gable and down into Wasdale Head. After crossing the shoulder of Stand Crag the path came to a rather tricky down scramble, something I hadn't really expected on what I thought was a fairly straight forward route. We both made our way down safely with a few bum slides thrown in along the way. The path crossed another gill then rounded Round How before crossing Greta Gill. Shortly after which we met a path heading uphill to the left that looked fairly well laid. I examined the map and it looked like a viable short cut path to the col between Broad Crag and Scafell Pike. Unfortunately after a short while that well laid path gave way to a very steep scree slope. Tim wasn't impressed at all, the going was very hard and every metre forward there was half of one back. 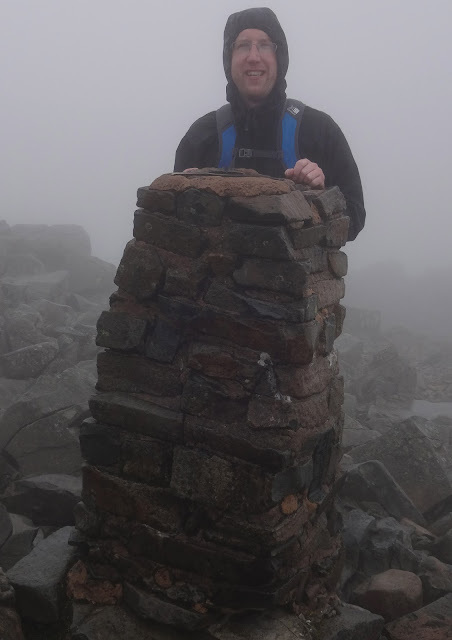 We made it to the col then followed a fairly easy and familiar ascent south west to the summit plateau of Scafell Pike. I've been on this summit three times now and still not seen anything other than cloud and drizzle. I'm told the views are absolutely stunning on a clear day. Maybe one day I will find out but that day wasn't today. One thing I like to remind people of when I join them standing on top of the countries highest is that right now they are the highest person in the country, something which I still think is pretty damn cool. It was now cold, windy and raining so we took the obligatory summit shots and a compass bearing then made our way north west down the popular Wasdale path. I knew that the Corridor Route leaves the right side of the Wasdale descent path just after it has switched back to the right then left but unfortunately I was completely seduced by some stone cairns at the top of a shortcut path which heads in the same direction but a little too soon. This path was well cairned but was very tricky with some difficult down scrambles. 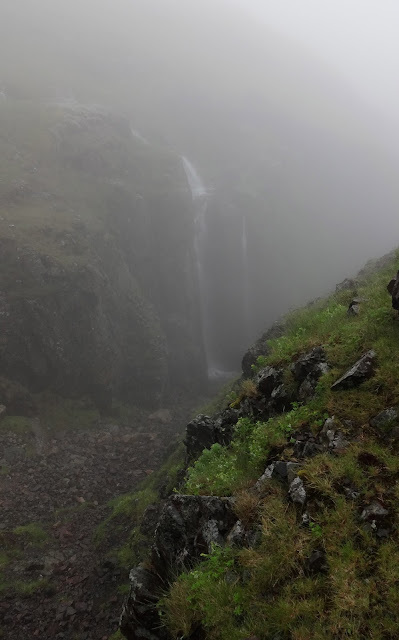 Eventually I heard the noise of running water and predicted it could be the top of Piers Gill. Fortunately I was right and we found ourselves joining the path we should have been on and at the top of the incredible Piers Gill. There are gills and then there is Piers Gill, it is quite simply massive. The waterfalls falling into the top of the gill were stunning. I was quite relieved to see Piers Gill as I have to admit I wasn't too sure where we were for a while and visibility was down to around twenty metres. We headed along the path and passed the slow walkers we saw at Seathwaite who despite the weather all seemed very jolly. After a while we came to the point where earlier in the day we had turned left up the path that turned into steep scree. We continued along the path, out of the clouds and found ourselves at the foot of the small scramble we down climbed earlier. After the scramble we continued descending the path over Stand Crag then down and over the stunning Skew Gill. The views opened up over Styhead Tarn but the views were soon replaced by driving rain and strong winds again. When we reached Styhead Tarn the rain was so bad we were rushing along at a brisk pace holding our hoods to stop it whipping our faces. The wind had picked up so much that the waters on Styhead Tarn resembled the waters of the Irish Sea with white waves thrashing into the soft eroding banks. The descent down Greenhow Knott on the return leg was not easy now that the rocks were all wet and slippery. 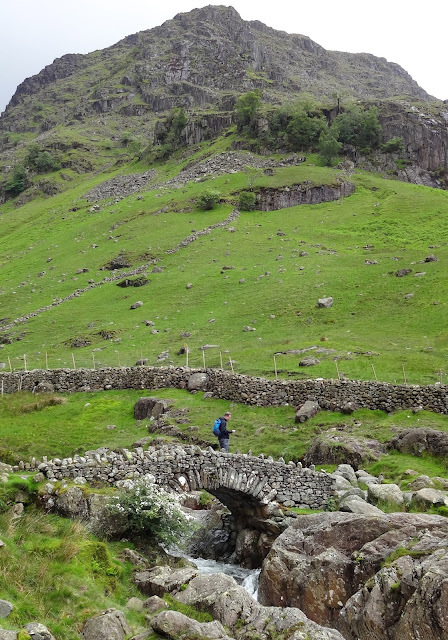 We crossed Stockley Bridge and made our way back along the track to Seathwaite in torrential rain and driving winds. The poor new car didn't know what was happening when two fully grown drowned rats jumped into it. Despite being absolutely soaked we both agreed we'd had a great walk. Tim was pleased to finally climbed one of the mountains he will face on his challenge and I was pleased to report that my ankle had held up well. it's a great walk that route. Wainwright had it in the top routes in the Lakes. Bad weather or good, it is always a good walk. Thanks for that Jamie. You did well Jamie, that looks like a seriously painful ankle. Well done on completing your walk - your write-up makes for a good read. Crikey Jamie!!! That's some mean ankle injury mate!